Featuring a super-slim profile with an X-shaped stand, Acer G-Series monitors can fit nicely in spaces of any size. They deliver outstanding performance, eco-friendliness and smart use of energy complement the sleek design while staying well within budget. 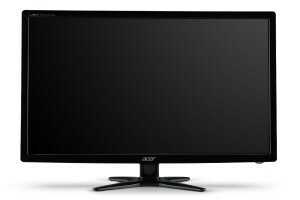 The Acer G276HL Dbd features a large 27″ Widescreen LCD with impressive 1920 x 1080 resolution. The remarkable 100 Million:1 contrast ratio means you will have a crystal-clear viewing experience. And the rapid 6ms response time ensures sharp moving images. Supporting both VGA and DVI-D inputs, this unit delivers greater compatibility. Like gaming and watching movies on a large screen? No problem with this Acer G276HL Dbd. As a 27-inch monitor with LED back lighting, this unit is great for gaming and watching movies. And its high 1920×1080 resolution means you can watch HD movies and show much information on the screen. If you are looking for a gaming machine that won’t break your budget, then this Acer G276HL Dbd 27-Inch Screen LED-Lit Monitor is your ideal choice. There are no motion lag problems since it features 6ms response time.